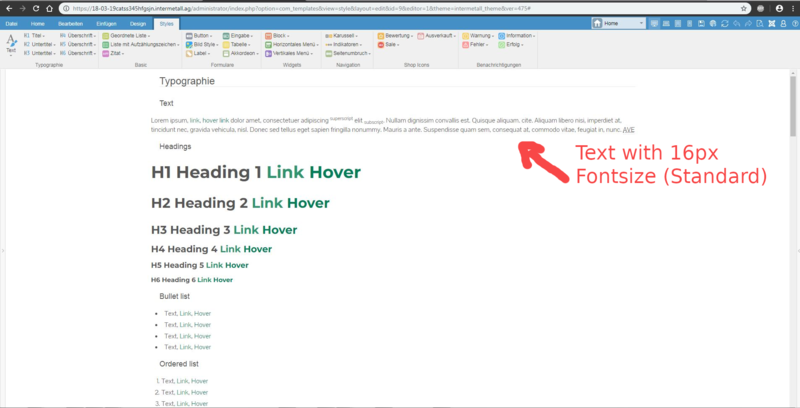 Ich möchte auf meiner Webseite Text responsive gestalten, also ich möchte em statt px verwenden. Wenn ich in more Styles die Textgröße, in 1em (vorher Basisgröße 16px) angebe, wird der Text unglaublich klein. Der Text sollte mit 1em doch aber genauso groß bleiben wie mit 16px. Wie kann ich das Problem lösen? Oder habe ich gar einen Denkfehler? 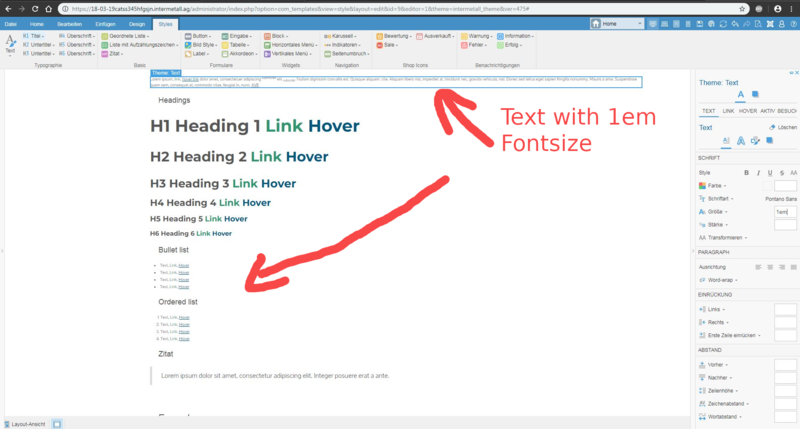 I want to make text responsive on my website, so I want to use em instead of px. If I specify in more styles the text size, in 1em (previously 16px base size), the text will be incredibly small. The text should be just as big with 1em as with 16px. How can I solve the problem? Or do I even have a mistake? I have tested using 1em vs 16px and the font doesn't change the size, as expected. Could you please specify how exactly we can reproduce the issue you mentioned? Or attach ypur theme please. Danke für Ihre Antwort, Ich möchte ja möglichst responsiv mit dem Themler arbeiten von daher ändere ich wenn möglich jede px Einheit zu em oder % um. Und das tue ich auf der "More Styles Seite" im Themler. Ich hoffe die angehängten Bilder helfen Ihnen, das Template ist ebenfalss angehängt. Thanks for your answer, I would like to work as responsibly as possible with the Themler of therefore I change if any px unit to em or% if possible. And that's what I do on the "More Styles page" in the Themler. -> in the gray horizontal menu then select "Text"
I hope the attached pictures help you, the template is also attached. I can see the issue. For some reason changing px to em in general settings put the base font size (starting point) to 8px. I will report this to the developers. Meanwhile you can try setting the general font to 1.6em (this would keep 16px size, but you may need to decrease the line spacing) or set 1em to separate controls of the site? like post content, headings, menu, etc. I checked in the live preview, 1.6em transfers as 16px.